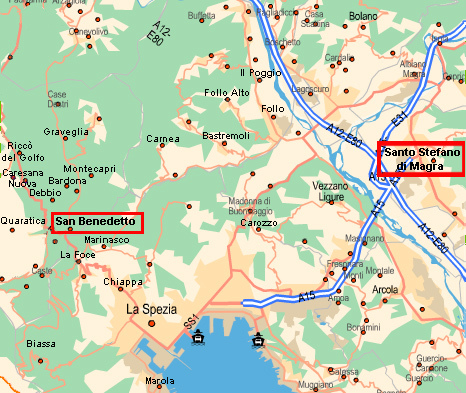 - go out of the highway, turn left, in the direction of "La Spezia", as far as "Borghetto Vara"; turn left again in the same direction (La Spezia), and continue for about 12 kms, as far as "Riccò del Golfo di La Spezia"; from here pursue to "San Benedetto". Go past it and go on for about 1 km as far as a crossroads where, on your left, you can see the "Mobilificio Franzoni"; turn left to "Beverino", after about 200 meters on your left enter an excavated road and go along it for about 50 meters. - go out of the highway and take the speedway to "La Spezia"; arrived in town, run along via Carducci, viale Italia and viale Amendola, turn right and, after about 500 meters, at the crossroads, turn left into via Genova. 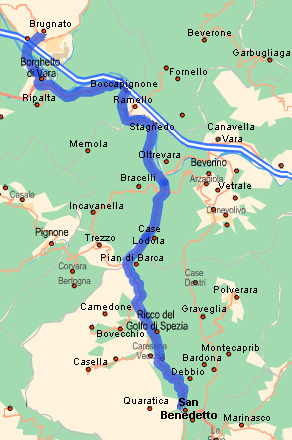 Run along it for about 4 kms, and go past "La Foce" in the direction of "Beverino"; at the crossroads on your left there's the "Mobilificio Franzoni"; from here turn right to "Beverino" and, at about 200 meters on your left enter an excavated road, and run along it for about 50 meters. Also by train our B&B is easily reachable, going down the station "La Spezia Centrale" it's possible to reach the B&B by bus. The bus stop is "Ponte Graveglia", at the crossroad to "Beverino." The tickets (rate 02), are easily purchasable in any café-shops. The airports of Pisa (Galileo Galilei) and of Genoa (Cristoforo Colombo) from which you can arrive al "La Spezia" by going along the A12.